Oil massages are highly relaxing and harmonizing. They are an optimal means to attaining good physical condition and mental ease. Quality natural oil is used to massage the entire body. According to the type of oil selected, it also has aroma therapeutic and physiotherapeutic effects. We currently offer 7 types of massage oils. This unique hand massage using special anti-cellulite oil results in release of excess fat , detoxification, loss of centimetres, smoothing of the skin and alleviation of cellulite. Slimming massage is purpose massage and the least relaxing of the series of oil massages. 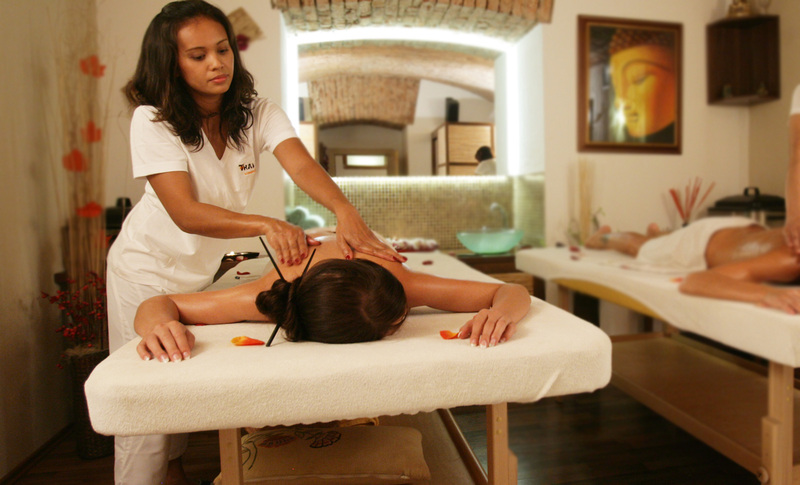 The Hawaiian Massage of „loving hands“ with long, deep strokes, relaxes muscle tension and agitates energy. It also affects the emotional, mental and spiritual levels. Massage using hot oil from a lighted aromatic Guergi massage candle results in perfect relaxation of the body and mind, relief of stress and boosting of energy. The unique composition of natural substances provides nutrients to the skin. The hot oil rich in minerals and the candle light give you pleasant relaxation and a remarkable experience. For this exclusive massage, we use oil with 24 Carat Gold. The Gold acts against ageing of the skin, stimulates the metabolism and protects cellular DNA. The Gold, at the same time, has a great influence on detoxification and regeneration of the epidermis. It lends the skin youthfulness, energy and lustre. Visit us and experience the exquisite feeling evoked by our experienced and qualified Thai masseuses.